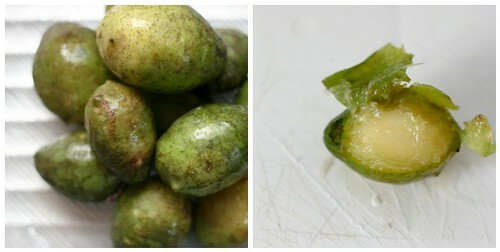 Today's fruit is the umbú, which is also called the Brazil plum or "spondias tuberosa" (how technical!). It looks a lot like a key lime, sometimes with little horns. I tried to cut one open but was thwarted by a very hard pit. The skin came off readily, though, so I peeled it and found yellowish, pulpy fruit inside. Doesn't that little guy on the right look like a fish? Cute! I like the taste of the umbú. It's quite tart, kind of like a lime. The fruit really sticks to the pit which makes it a little bit difficult to eat. Ken sprinkled sugar on his to make an all-natural Sour Patch Kid. Delicious! Wikipedia says it's usually boiled down with sugar to make jams or preserves, which makes sense. Also from Wikipedia: The fruit's name comes from the indigenous phrase y-mb-u, which means "tree that gives drink." I like that.